Nothing makes a getaway more relaxing, romantic and memorable than to be surrounded by lush gardens. What better way to refresh yourself than to enjoy the natural colors and scents of flowers, whether it is in a formal or cottage garden. 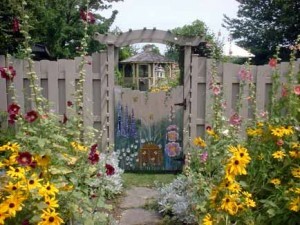 Many bed and breakfasts feature outstanding gardens; here are some remarkable ones. Off the beaten path on a secluded lane, conveniently centered between Bainbridge, Afton and Oxford, in the heart of Central New York, sits this beautiful Victorian home with a wraparound porch. It is situated on a hilltop and affords a majestic view of 300 acres of gardens, lakes, ponds, woods and meadows. Guest Rooms are named after garden favorites, like Trillium, Ginseng, Honeysuckle and Blueberry. Located above a small wooded glen near Burlington, Vermont, Hidden Gardens B&B is surrounded by 26 acres of woods and gardens, considered to be among Vermont’s largest. Curving paths wind through an extensive collection of varied plantings including hostas, shrubs and perennials and flow onto elegant open lawns. Beautiful conifers and other specimens make the gardens a year-round delight. 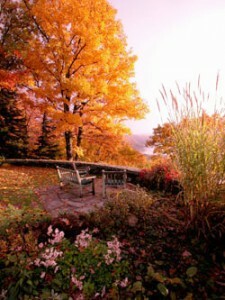 The bed & breakfast borders on over 120 acres of protected natural habitat and Vermont Fish and Wildlife land. The inn offers outdoor English High Teas for group bookings. The gardens on Gideon’s Ridge in North Carolina cover five acres of wooded mountaintop interspersed with stone terraces, cultivated planting beds and green lawn. Views are enjoyed of Pilot Mountain to the East and Mount Mitchell to the Southwest. More than 30 varieties of trees can be found at the inn, and the cultivated gardens include many varieties of heaths and heathers, roses, hostas, daylilies, irises and hydrangea. The wildflowers include Blue Bead Lily, Bluets, Dutchman’s Breeches, Flame Azalea, Indian Cucumber Root, Jack in the Pulpit, Trillium (3 varieties) and May apple. 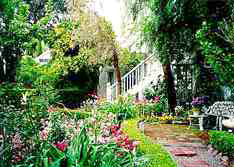 Victorian Garden Inn in Sonoma, California is situated within an acre of Authentic Victorian gardens. Pathways wind around to secret gardens and guests can walk to world-famous wineries and historical sites. You can even enjoy a therapeutic spa in the gardens. Butchart Gardens in Victoria, British Columbia is one of the most extensive (55 acres) and abundant gardens in North America. What better place to stay while visiting these elegant formal gardens near this very English town than at a British-style B&B with its own impressive gardens. The Tudor-style country manor house overlooks an acre of gardens, with waterfalls and its namesake gazebo and is surrounded by summer bulbs, lush blooms and elegant container plantings that have been created by their Master Gardener for over 30 years. 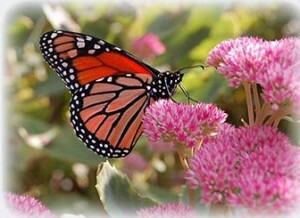 Throughout the seasons, the gardens are often visited by butterflies, humming birds, blue herons, barred owls, deer, racoons, pheasants and appreciative guests. in Marietta, Pennsylvania where tea is served in the garden gazabo in the full acre of gardens at Lavender Patch. 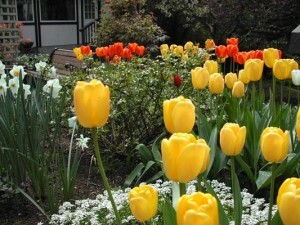 Cottage gardens surround the cottage-style inn and add to the festive occasions here. The innkeeper also offers cooking with herbs to those wishing to take classes together.